Dr. A. Mujib, a DAAD fellow (Germany), Department of Botany, School of Chemical and Life Sciences, Jamia Hamdard, New Delhi, India. M.Sc and Ph. D from University of Kalyani, W.B. 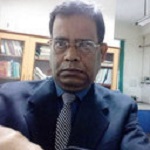 Formerly Research Associate and Mission Engineer, Department of Chemical Engineering, Indian Institute of Technology, Kharagpur. His research interest includes callus cells, regeneration, growth regulators, plant based regenerative medicine, in vitro embryogenesis, gene expression; proteomics, in vitro mutagenesis and crop improvement; chromosomal / cytogenetics and molecular analyses of variants, flow cytometric DNA analysis of plants; enhancement of secondary compounds.Published around 125 articles; supervised 15 Ph. D students; editorial board member of 35 Journals; reviewing for about 70 Journals.